We got to have a date night Friday thanks to my awesome in-laws who were able to come over and babysit our sweet boy. 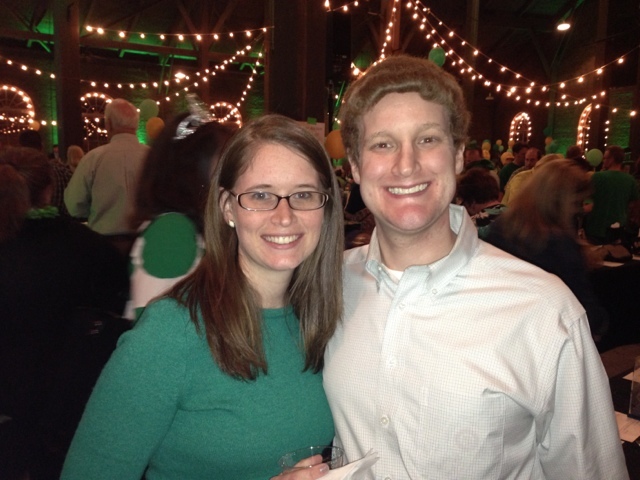 For our date night we went to the annual UCP fundraiser "An Irish Evening" in honor of St. Patricks Day. The event was a litte different from last year - more casual, more people - but just as fun. We got to eat some good irish food like corned beef and soda bread and some not so irish food (pizza and bundt cakes?!?). We also got some great stuff at the silent auction. Perry apparently was worn out from playing with Daddy all day Friday because he slept all evening for granna and granddaddy. Friday night was a lot of fun and a great start to a busy but fun-filled weekend.